"I have a unique and personal style when it comes to the drums, and Yamaha compliments me perfectly." 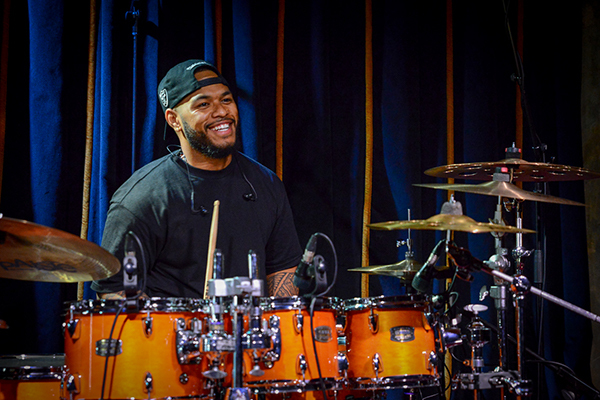 Joe Malafu is a Brisbane based professional musician, specialising in studio and tour drumming. Joe is versatile and proficient in several instruments (guitar, piano, percussion), with focus on drumming in numerous styles (Jazz, Latin, Soul, Contemporary, Rock, Pop, R&B). Originally from Auckland NZ, Joe first began playing drums for his church, from here the love and passion for music only grew. Joe completed his certification in Contemporary Music at the Excel Performing Arts Institute in 2011, and this provided the platform for Joe to share his talents with other musicians. After performing with several local acts, Joe made the decision to leave it all behind and move to Australia to further his career in music. Once in Australia, Joe developed relationships amongst the local music community, and quickly became recognised as one of Brisbane's leading drummers. It was only a matter of time before Joe's talents were noticed, and he was approached to be a part of his first nationwide tour, as the drummer for Amy Shark. This tour involved assisting the band develop a stage presence, and also understand the dynamics of performing to a large audience. The tour was a success, and Amy and the band have scheduled a follow up headline and international tour for early 2018. Aside from continuing live performances, Joe dedicated his time to sharing his knowledge and teachings. Personal tuition, online classes, and a fortnightly "Drum Shed" are just some of Joe's initiatives to share his love of drumming. Having only been living in Brisbane for 18 months, Joe has accomplished a great deal in 2017 and is focused on furthering this development into 2018.